If you are a new parent to the world of autism spectrum disorder, let me be among the first to bid you welcome. This diagnosis is not an easy one to deal with at first but it will get better. It may not seem like it right now, but in time, you’ll start seeing some bright spots. I’m not suggesting that you go out and celebrate your child’s newfound diagnosis, but for right now- take a deep breath, count to ten, have some coffee (with some Bailey’s if you need it), and relax. You’ve got this. My daughter was diagnosed in 2004 and one of the first things that I turned to were books. Then I looked for support groups and internet resources but for me, nothing beat a good book. I want to share my personal recommendations for top ten books about autism for new parents and loved ones. I am a lover of books, and after my daughter was diagnosed with Autism, books were my first go-to resource. This world on the Autism Spectrum Disorder can be overwhelming, but know that there is hope and help. This will be the first of a few top ten books about autism posts, as I also wish to share recommendations that are specific to my situation and ones that I feel were significant in helping me cope. Later on, you can expect to see Top Ten Books About Autism: For Parents of Girls and Top Ten Books About Autism: Personal Stories. Please note that this list is no particular order, and there are numerous that I could also include. I just wanted to share the top ten books about autism that helped me the most after my daughter’s diagnosis. This book was one of the first that I bought in an attempt to hopefully understand my daughter. I was more concerned with the length of the book (wanting something that I could read in between crying sessions) than the actual content, so it was a pleasant surprise that the content surpassed my expectations. Right off the bat, this is one of the first books that I recommend to parents who are starting on the autism journey. This book was also one of the first that I bought (I believe in a handful of four from a local bookstore) and I have bought the updated edition as well. I highly recommend this book for the clear cut way it’s written and the explanation of terms without being too medical and formal. For parents who are a bit overwhelmed at first (and that applies to most of us), I think that this is a must buy. And not just for parents, but for loved ones, family friends, etc. As you’ll see above, I recommend quite a few books by Dr. Temple Grandin and honestly, I would recommend everything that she’s written. I’ll have another top ten books about autism list concerning memoirs/personal stories but I felt that Dr. Grandin deserved to be on this list. To read about the spectrum from her point of view- an accomplished adult who just so happens to be on the Autism spectrum; her story is inspiring and her insight is enlightening. In this book, in particular, Dr. Grandin goes into the inner workings of how an individual with autism thinks and how they process information. This is Dr. Grandin’s first book and my first experience with her work. My mom is actually the one who bought this for me and I’m so grateful that she did. Since my daughter is non-verbal, this helped me to really understand the importance of visuals in her every day life (from using PECS at home to creating visual schedules to help her with her routine). After reading “Thinking in Pictures”, I knew that I had to buy this book as well and I wasn’t disappointed with my purchase. Dr. Grandin delivers another solid and very informative book. Potty training can be a difficult task to begin with, but potty training with autism involved can be especially daunting. But, don’t let that intimidate you. This book has been especially helpful with my daughter. This book offers real life, effective strategies and with patience, and persistence- potty training can be another life skill that you can check off. This was more of an impulse buy than a planned buy as I hadn’t really heard much about the book before seeing it on the shelf. I was immediately intrigued by the fact that the author had three children on the spectrum, so I figured she would be a reliable source of information. And I was right. This book is highly recommended. I bought this book because I wanted to supplement, in a sense, with other therapies that my daughter was receiving. I figured that if I could do stuff with her at home, it would only help her in the long run. Floor Time is just one of many designed therapies used to help individuals with Autism and something that I’ll definitely get into at a later time. I enjoyed that this book could be used by both professionals and parents, since I fall into the latter category. I bought this book after becoming quite irritated with certain celebrities using the word ‘cure’ and ‘autism’ in the same sentence. There is no known proven cure. Yes, symptoms can be lessened but autism is with you for your life. The autism-vaccine debate is one that I try to stay away from, as it just generates a lot of heated conversation that can also get quite ugly. I don’t know about you, but I have more important things to do than get heated about what causes autism. I’d rather focus on helping treat it. This was another of the first books that I bought in hopes of better understanding the journey I was about to embark on.. or rather, the world that I was suddenly thrust into. And another that I would highly recommend. The information is clear and organized, something that I found very useful as a distraught parent. 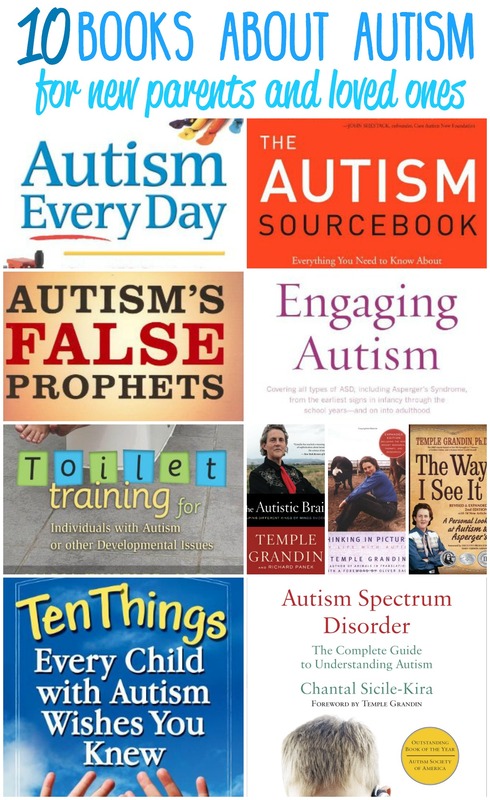 So, there you have it- my top ten books about autism for new parents. I would also recommend these to family members or anyone who might know someone who is a parent or caregiver of an individual with autism. These books, while not all encompassing, are helpful and useful. Do you have a go-to book that helped you get through your child’s diagnosis? “If you’ve met one person with autism, you’ve only met one person with autism”. I love that quote because it is so true. My 17 year old son is on the Autism spectrum. I would highly recommend Temple Grandin and seeing if you can find any of her talks on YouTube. She’s just an inspiration to me. Yes, she’s such an inspiration to me. Reminds me really of everything that can be accomplished. This is a great list and resource! The diagnosis can seem so overwhelming at first and these books will really help explain and explore autism. I have one more book to add: How to be Human by Florida Frenz. It tells her journey through autism to a social world. She is an amazing teenager! She promises hope for those who are just beginning their journey. This is a very comprehensive list of books that I’m going to keep in mind for gift giving to friends with beautiful, special kids. 🙂 I also realize that I could have added so many more, but I figured it would be best to start with 10. This is a great resource! Thank you! I have a friend, whose child was just diagnosed, and she’s been asking for some helpful books and resources. What a wonderful list you have put together. I have a close family friend whose son was just diagnosed and I have been looking for ways to be able to support her through their journey. I am marking these books down now and will pick them up at the library this week. Thank you so much! Great list! pinned for reference. Thank so much for sharing! Thank you 🙂 I hope it is of some use! Excellent list. I bookmarked and shared! Great resources Kori! My nephew is on the spectrum so it would be good for me to learn more. I will pass it along to my sister also. Thank you, Melissa 🙂 I hope that there are some that will be of use! 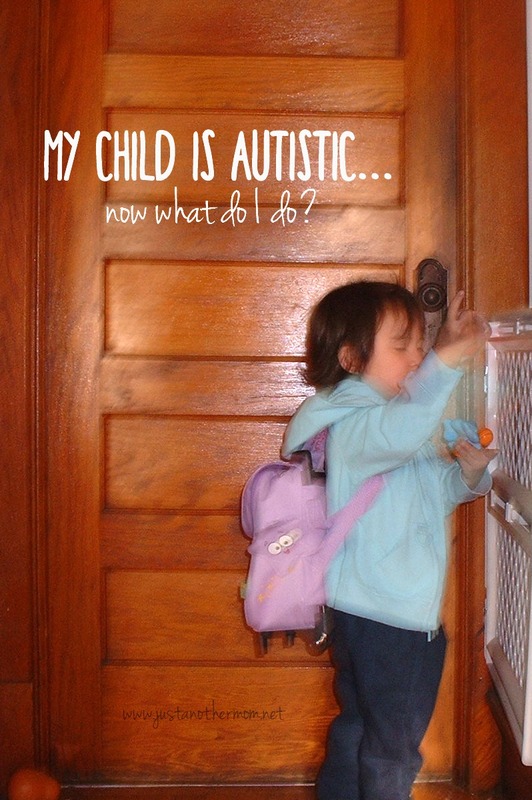 Great resource for anyone wanting to learn more about autism. Thanks for linking up at the Bloggers Brags Pinterest Party. Sharing this with a mom in my class! Thanks for linking up with us a the Mommy Needs a Timeout Thursday Linky. Hope to see you again this week. Party starts Wednesday night at 8 pm EST! Thanks for sharing this week at the #SHINEBloghop, I am sure this list will help so many people! Have a wonderful week! Hi, I can’t see your list, it just shows the descriptions of the books without the titles. All fixed, thank you for letting me know!